The Donald W. Hamer Center for Maps and Geospatial Information digital map drawer contains the subset of our physical map collection that has been digitized and is not protected by licensing or copyright. The digital map drawer contains a nearly complete collection of the Sanborn Fire Insurance Maps of Pennsylvania (1884 – 1938), historical maps from around the world, and an assortment of other historical Pennsylvania maps including the 1861 Tilden Map of Centre County. The digital map drawer can be accessed by using a keyword search on this page; or by keyword and geographic search using the Big Ten Academic Alliance’s Geoportal, to which Penn State contributes. 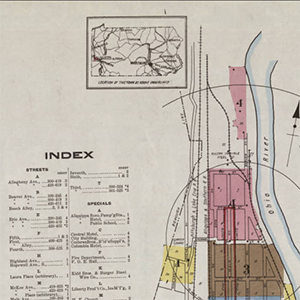 Many, but not all of our print maps have been cataloged and are discoverable via the library catalog. For help searching the library catalog for print maps and imagery, please consult this guide.